British furniture manufacturer (and retailer) SCP, has a new chair and ottoman designed by Matthew Hilton. 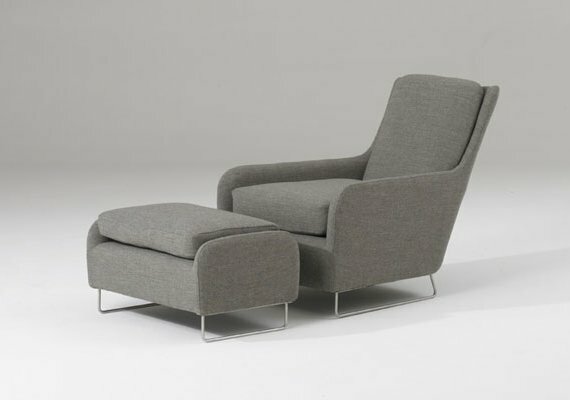 Matthew Hilton has taken inspiration for the Berwick lounge chair and ottoman from the elegance and subtlety found in the work of Vico Magistretti. The Berwick chair is made from a hardwood and steel frame, has a full feather removable cushion and sits upon brushed stainless steel glide legs. The ottoman also has a removable cushion cradled in position and sits upon square ended stainless steel glide legs. The Berwick is evidence of a maturity of style, a confidence and an unspoken understanding of desire in Matthew Hilton’s work. The chair is reminiscent of a suspended racing car seat, with a curved back and low-slung arms. Viewed from the front the chair has a feminine slimness at the waist, whilst the profile view reveals a little laid back luxury. Visit the SCP website ? here.